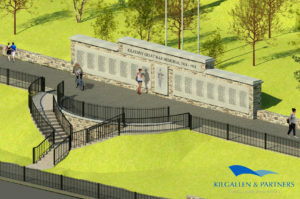 Work on the new World War 1 memorial for Kilkenny City is now under way and expected to be completed in June 2018. The memorial will recognise some 825 Kilkenny men and women who lost their lives in the Great War and acknowledge more than 3,000 men and women from Kilkenny who served in the War. The monument is being developed at the River Nore Linear Park adjacent to Michael Street. Kilgallen & Partners provided detail design services for the project. All plaques, statues, nameplates and capping stones are being cut from Kilkenny Limestone. The works are being completed by John Somers Ltd under contract with Kilkenny County Council. 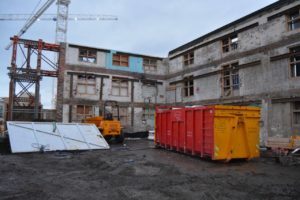 Kilgallen and Partners have carried out the temporary works design for this hotel development. The design includes retention of the existing protected brick façade to enable the excavation and construction of a two storey basement and the construction of a 5 storey superstructure, temporary propping of the secant pile basement wall, temporary stability of No. 81 using internal shoring whilst ensuring the protection of the existing building fabric. 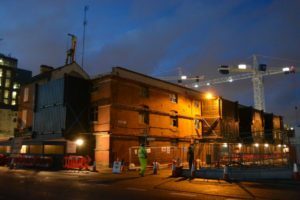 The temporary works solution includes the use of shipping containers as a façade retention system, which presents a sustainable, reusable solution and has already withstood the force of Hurricane Ophelia. Kilgallen and Partners wish every success to the Client and all involved. 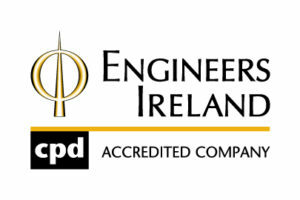 I wish to personally congratulate you and the whole team at Kilgallen & Partners Consulting Engineers for achieving re-accreditation to the Engineers Ireland CPD Accredited Employer standard, the national CPD standard for engineering-led employers in Ireland. You have been successfully benchmarked against a rigorous standard on all aspects of your CPD policies and processes and you now retain your membership of a network of leading organisations, indigenous and multi-national, which is wholly committed to the continuing professional development of staff. We encourage you to celebrate this success and we are confident that the structure of the CPD framework will constructively challenge you to continue to promote sustained and structured CPD as an essential foundation for the achievement of both organisational and individual objectives. Being a CPD Accredited Employer confers many advantages, including the ability to benchmark against other organisations in our annual CPD Employer of the Year Excellence Awards, inclusion on our published register of accredited employers, access to our LinkedIn Group, invites to knowledge sharing events and a free mid-point meeting to ensure that you are keeping ‘on-track’. Well done again – you should be very proud of this achievement! Kilgallen & Partners’ design for a new roundabout on the N24 at one of the most dangerous and busiest junctions in County Limerick has been backed by Councillors in the Cappamore-Kilmallock municipal district. Tim Fitzgerald, of the Mid-West National Road Design Office and Kilgallen & Partners Consulting Engineers gave local councillors a presentation on submissions received after it went on public consultation. It will be a four leg roundabout, north and south on the N24 with links to Mitchelstown and Murroe-Boher GAA club’s pitch. Cllr Brigid Teefy said the progress is “very, very welcome”. “We have been waiting so long for this. It is so, so busy,” said Cllr Teefy. The Ossory Pedestrian Bridge was officially opened to the public on 23rd of October 2014 by Mayor of Kilkenny Mr. Andrew McGuinness and Chairman of Kilkenny County Council Mr. Pat Millea. Kilgallen and Partners provided full design services from concept through to completion. The bridge is the longest span timber beam bridge of its kind in Europe. For more details please click on our Bridge section under Civil Projects http://kilgallen.ie/bridge-assessment-repair/. Kilgallen & Partners have been appointed as Employers Representative (ER) for the construction phase of Mungret Schools Project (Roadworks). Works have commenced on site and the project is due for completion by Summer 2016. Kilgallen & Partners (UK) Ltd. opened their new office in Feb. 2014 in Hammersmith in London. The office continues to grow and has recently completed the structural design of the £7 million Engineering Building Refurbishment (Phase 1) at Queen Mary University of London.